National Pizza Day was dedicated to appreciate pizza, a baked flat bread that is topped with red sauce, a lot of cheese and sometimes meat. Many other toppings and sauces can be added to pizzas as per our choice such as vegetables, seafood and even fruit! Pizza was invented in Naples, Italy around the 10th century, and it has since then grown to become one of the most popular foods in the world. The first Pizza outlet opened in 1905 and was known as Lombardi’s, which opened in New York. Since then, pizza intake in America has increased greatly and many pizza chains, such as Domino’s, Pizza Hut and Papa John’s have emerged into the market. However, the origin of National Pizza Day is not well understood though accounts of National Pizza Day initiated to arise around the 2000s. National Pizza day is celebrated every year on February 9th worldwide. Did you know that a flat sheet of dough topped with cheese and honey, then seasoned with bay leaves was developed by the Ancient Romans? If we see the modern pizza, it had its creation in Italy as the Neapolitan flatbread. However, the original pizza was only topped with mozzarella cheese, it is considered to be the highest quality of buffalo mozzarella variant which was produced in the surroundings of Naples. 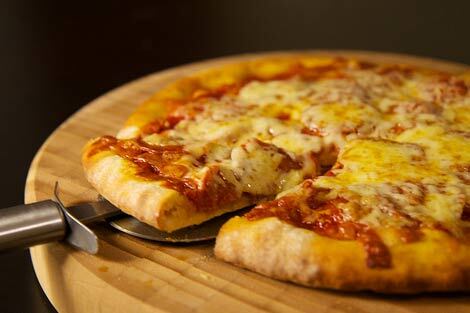 It was expected that the annual making of pizza's cheese in the United States in 1997 was about 2 billion pounds. There are more than 70,000 pizzerias only in the United States, can you guess how many we will have in other places? Did you know that about 350 slices of pizza are consumed in every second in the United States alone? The maximum number of pizzas that are delivered or eaten in the U.S; is on New Year’s Day, New Year’s Eve, Halloween, Thanksgiving Eve and Super Bowl Sunday. Hold the toppings, and add a variety of cheeses. It’s National Cheese Pizza Day!! !